Welcome to the Shostakovich Region of the 2016 HornRank Marching Brackets! You can read about how we seeded shows or vote in the Copland Region, the Reich Region, and the Barber Region. The first round closes on Wednesday, March 23, 2016, at 11:59 P.M. The most recent Grand National Champion grabs the 1 seed in this region of the bracket with Broken Arrow’s Shostakovich-filled “Wild Blue Orchid”. Wild Blue Orchid's stunning 97.50 was the culmination of another year full of world class design, artistry, performance, and demand from Broken Arrow. Round Rock’s 2013 performance of “Elemental Evolution” grabbed an 8 seed because of the impact their show has made on the activity. 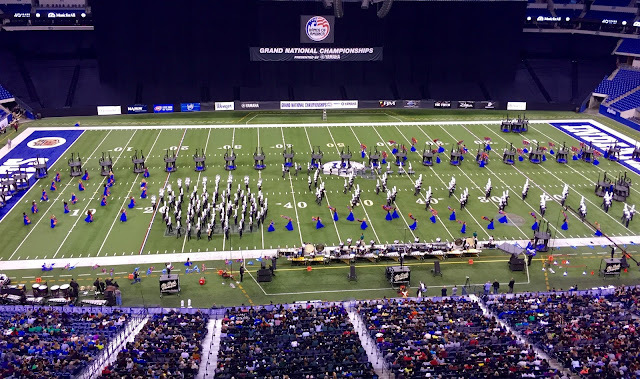 2013 was Round Rock’s first appearance at Grand Nationals, and they left Indianapolis with a 4th place finish, a music caption victory in Semifinals, a Rose Bowl bid, and a thoroughly enjoyable show. They are now one of the country’s beloved programs, and this show was a large part of their ascent to national recognition. Tarpon Springs’s “Paranormal” in 2010 escalated their program to rock star status among the BOA community, performing what might the all-time fan favorite of BOA shows. From woodwind rifts to large brass sounds to a girl levitating in the air above her bed, Paranormal left crowds entertained and amazed. “Echosphere” is one of the Lawrence Central (now Lawrence Township’s) program’s greatest shows of the decade and one of the older shows in our bracket, hailing from 2008. Carmel took home the Eagle in 2012 in one of the most competitive Grand Nationals years to date. “What a Tangled Web We Weave” featured some of the best brass and woodwind musicianship of this decade. Flower Mound asserted their place as a national powerhouse program in 2015, winning San Antonio and jumping from 44th in individual music at San Antonio in 2013 to winning the music caption (in prelims) in just two years. We’re excited about this group’s future in years to come; “Surreal” may be just the beginning of consistent world class performances for Flower Mound. Avon’s second of three straight Grand Nationals championships came in 2009 with “Comm-UNIFORM-ity”. Avon’s 2009 band is another example of a group that advanced the activity, thanks in part to unheard of musical and visual demand. They are up against Broken Arrow’s Wizard of Oz-based show “Zo”. A light-hearted show featuring stunts and tubas on bicycles, this show is just another example of Broken Arrow’s continued captivating show designs and dominance in BOA competitions. Make sure to also vote in the first round of the Copland Region, the Reich Region, and the Barber Region. Thanks for your feedback! Flower Mound won the music caption in prelims, the same round of competition they placed 44th in two years ago. I updated the article to clarify.